KINSHASA, 29 Jul 2006 (IRIN) - The first round of the biggest elections the United Nations has ever supported are on track for Sunday, a United Nations (UN) military spokesman announced in Kinshasa, capital of the Democratic Republic of Congo (DRC). "The UN has dispatched electoral materials to every corner of the DRC," Lt-Col Stéphane Lescoffit told a news conference on Friday. 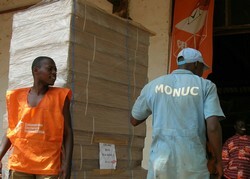 To accommodate the 25.7 million registered voters, the UN Mission in the DRC, known as MONUC, has also helped to set up at least 50,000 voting stations across the country. The Independent Electoral Commission was responsible for printing the ballot papers. With 33 candidates running for president and more than 9,700 candidates for the 500-seat parliament, each ballot paper is up to eight pages long. There are 170 versions of the ballot for each constituency. The head of the electoral commission, Apollinaire Malumalu, said there was still some organising to do before Sunday. "Basic training of all the elections officials is not finished; accreditation of election witnesses and observers is still incomplete," he said. However, he expressed confidence that these issues would be resolved in time. The commission has come under criticism for repeated delays. It has still not made public the list of voters. Malumalu had told IRIN in May that the list would be posted in public places 30 days before election day so that people could submit complaints. On Friday, he said the list would appear on Saturday. Asked to explain the delay, he said, "This will ensure that protesters don't destroy it." The dates for the second round and other subsequent elections would also be published then, Malumalu said. Election campaigns ended on Friday at midnight. No more demonstrations or rallies will now be allowed. Malumalu said the main opposition Union pour la démocratie et le progrès social (UPDS), which is not taking part in the elections, planned to stage sit-ins at voting stations across the country on Saturday and Sunday in protest. "They must know that nobody can prevent people from voting," he said. In the run-up to the elections, the international community, with churches and local NGOs, funded a massive civic education drive. However, many Congolese still lack basic information about the process, particularly in remote villages that do not receive radio or newspapers and where many people cannot read. In a village near Bunia, the capital of the northeastern district of Ituri, many people said they knew the election was due on Sunday but some seemed confused about how it would work. "I know we are voting for the president but do we vote for parliamentarians too?" Martin Ngabu said. The two elections have been combined. Even in the centre of Bunia, many people said they lacked basic information about the process. The electoral commission said it would post information at public sites and make radio announcements, but by Friday they had not appeared. In South Kivu Province, people also lacked information. "Some voters clearly do not understand the voting process," said Denis Buhendwa, who works for Groupe Jérémie - an association of human rights and civic education NGOs. Also in Kinshasa, many people said they did not know what would be expected of them on Sunday. "Will someone ask me the name of the candidate and I will have to tell them?" a woman, who declined to be named, said. In fact, the vote is secret. Despite these doubts, many people seemed hopeful that on Sunday they would be able to work out what to do. In Bukavu, capital of South Kivu, Jules Katiwa said: "I am voting for the first time and what I know is that the best voter is not the one who studies techniques for voting but who is willing to do his civic duty."